Super lightweight synthetic and fabric upper. 360 Degree Responsive Flexibility allows your foot to move naturally. Integrated Ortholite™ anti-microbial sockliner helps inhibit odor and prevent slippage. Super flexible sole. GO Impulse™ sensors move together and independently to provide sensory feedback to the brain. A natural stride provides a more efficient and responsive walk. This style of footwear is trend-savvy, appealing to men, women, and children. These are the only tennis shoes that I own. I have 4 pairs, beige, gray, navy, and black. The only shoe I wear, besides my flip-flops, (which I’ll do a review on in the future). For the last 6 years, I only wear my Skechers Go Walk 2. There is a newer ‘version’ of these shoes. But I have yet, needed to replace the ones I have. So with that said, they are very durable. I have one pair that is over 6 years old! I have washed them in my washing machine. They come out looking great. I don’t put them in the dryer. I just set them outside in the sun. My black ones, I won’t place in the sun, I just put those on my back porch. I can also place them on the table/floor/etc. and they’re dry within about a day. I really like that fact that they’re slip on. And it’s not difficult to take them off. They do stay on your foot. And they fit my wide feet!! Size mentions M–but they fit me perfectly. That’s always been my problem finding tennis shoes wide enough for me, and that is not made out of leather! In leather tennis shoes, my feet can’t breathe. They become hot and then begin to swell. 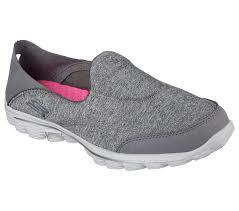 I do not have any problems when I wear my Skechers Go Walk 2. I wear them everywhere!!! They are really lightweight!! So comfortable. I can go for long walks with my husband and/or my dog, hiking, and I even work out in them. For me, I need no other walking shoe. I have even worn one pair I have, in the ocean. This shoe is great!! Now, I wouldn’t recommend wearing them in water, but that’s only because it wore the stripe color off of the sole of my gray shoes. But, that’s OK with me. This pair has become my beach shoes. I wear them when I go to the beach, just in case I want to wear them in the ocean again. I also mow the lawn in this pair. I wear them working in the garden. These shoes are very stylish and so darn comfortable. And this is why I own several pairs. I wear them with no socks. Although, I have seen others wear them with soaks. The sole of this shoe is very flexible. And, I have to mention again, they are so lightweight. Shoes are made for men, women, and children. Several styles, other than the Go Walk series. The only cons I could say I have, and that may be menopause related, then the shoe itself. When sitting for a period, my feet become hot. Not when I’m walking, just when sitting for an extended period. My Skechers work for me, far beyond my expectations for a tennis shoe. With the above said, it is why I gave this product 10 out of 10. If you’re looking for a comfortable, durable walking shoe, these will fit the bill. Would I recommend these shoes, YES!